New PD-1/PD-L1 therapeutic antibodies (Pembrolizumab, Atezolizumab and Nivolumab) release! 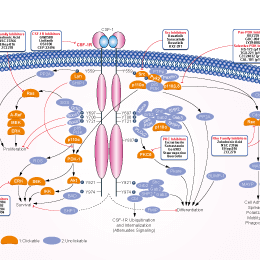 Pexidartinib (PLX3397) is an oral, potent mutil-targeted receptor tyrosine kinase inhibitor of CSF-1R, Kit, and Flt3 with IC50 of 20 nM, 10 nM and 160 nM, respectively. Phase 3. Next day delivery by 10:00 a.m. Order now. (a) Reduced tumour burden in PLX3397 (PLX) treated mice relative to untreated (NT) (n=6, P=.015; unpaired t-test). Bars represent total tumour volume with number of identified tumours indicated above each bar. Nat Commun, 2017, 8:14293. Pexidartinib (PLX3397) purchased from Selleck. Quantitative analyses of CSF-1R phosphorylation induced by CSF-1 in macrophages with (open column) and without (solid column) CSF1R c.1085A>G genetic variant. Macrophages differentiated from peripheral blood mononuclear cells were serum starved for 18 hours followed by stimulation with CSF-1 100 ng/mL for 5 minutes with or without pretreatment with CSF-1R inhibitor, PLX3397. The phosphorylation of CSF-1R was measured by phospho-MCSF-receptor sandwich ELISA Kit. Y axis, normalized CSF-1R phosphorylation. Each value represents mean ± SEM from at least seven different samples in each group. Clin Cancer Res, 2017, 23(20):6021-6030. Pexidartinib (PLX3397) purchased from Selleck. C) Immunostaining of CD4+ T cells (CD4, green), CD8+ T cells (CD8, green), B cells (CD19, green), NK cells (NKp46, green), monocytes and macrophages (CD169, green), neutrophils (Ly6G, green), and DAPI (blue). FASEB J, 2018, 32(6):3336-3345. Pexidartinib (PLX3397) purchased from Selleck. PLX3397 decreases the BrdU and retinal precursor cell markers, Chx10 or Pax6 (green) double-positive cells. Mol Vis, 2018, 30(24):536-545. Pexidartinib (PLX3397) purchased from Selleck. DeNardo DG, et al. Cancer Discov. 2011, 1(1), 54-67. Coniglio SJ, et al. Mol Med. 2012, 18, 519-527. Chitu V, et al. Blood. 2012, 120(15), 3126-3135. Sluijter M, et al. PLoS One. 2014, 9(8), e104230. * Please note that Selleck tests the solubility of all compounds in-house, and the actual solubility may differ slightly from published values. This is normal and is due to slight batch-to-batch variations. *When preparing stock solutions, please always use the batch-specific molecular weight of the product found on the via label and MSDS / COA (available on product pages). * When preparing stock solutions always use the batch-specific molecular weight of the product found on the vial label and MSDS / COA (available online). To calculate molar mass of a chemical compound, please enter its chemical formula and click 'Calculate'. Molar mass (molar weight) is the mass of one mole of a substance and is expressed in g/mol. 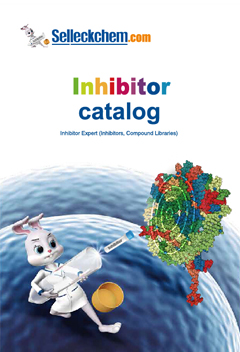 Answers to questions you may have can be found in the inhibitor handling instructions. Topics include how to prepare stock solutions, how to store inhibitors, and issues that need special attention for cell-based assays and animal experiments. If you have any other enquiries, please leave a message. I am going to use PLX3397 for mice experiment. but I am not sure how to dissolve it, could you tell me the detail? S7818 Pexidartinib (PLX3397) can dissolve in 10% DMSO/40% PEG 300/ddH2O at 15mg/ml clearly. Products are for research use only. Not for human use. We do not sell to patients. © Copyright 2013 Selleck Chemicals. All Rights Reserved.